My PhD is concerned with digital photography, more specifically, digital photographs that are altered, changed over time, by the integration of some kind of external ‘data’ – which might be the metadata (time, date, and geo-location) recorded by a digital camera whenever a photograph is taken, the output of an electronic sensor, or bird numbers recorded by the RSPB. Before coming to Mersehead, I knew relatively little about how the RSPB goes about gathering its ‘data’: information about bird population, migration patterns, and so forth. I had, of course, heard about projects such as those that attach tags to the feet of geese and track them via geo-positioning satellites as they make their way across the sea; and I somewhat naïvely assumed there would be lots of gadgets to monitor different kinds of birds and wildlife. It took only a few days here for me to realise, however, most of the RSPB’s day-to-day data gathering relies on something far simpler: the human senses. In my two weeks here I have taken part in a number of surveys, all of which have relied on either the eye or the ear to locate, observe, and count the birds found on the reserve. Often, the senses are supported by other instruments: a telescope, binoculars, or, in the case of the water rail survey, a compact-disc player. All the data recorded by hand in pen or pencil on a sheet of paper clipped to a clipboard. My second day here began with a lapwing survey: scanning the reserve’s fields through a telescope for a glimpse of a sitting lapwing, which might indicate the presence of a nest and, hopefully, eggs. I couldn’t help but smile, noting a certain parallel between the hours spent peering through the telescope for a bird and the time as a photographer I spend peering through the viewfinder of my camera looking for the perfect shot. About an hour into the survey, while scanning the fence-line for the lapwing’s distinctive black and white head, I happened to spot a roe deer nibbling on a bush. Eager to capture the moment, I pulled out my iPhone and set its tiny camera lens against the eyepiece of the telescope; after a few failed attempts, I eventually managed to snap a clear photograph. Over the next couple of days, I found myself returning again and again to this photograph, and I resolved to try the technique with a ‘better’ camera – my iPhone not really being suited to much more than the odd snapshot. On Sunday morning the sky was blue and the sun shining brightly, so I gathered together my cameras and the reserve telescope, and set out across the fields in search of some birds to photograph. My first few attempts were not especially successful, but after a time I began to get a feel for the position and the settings needed for the camera. 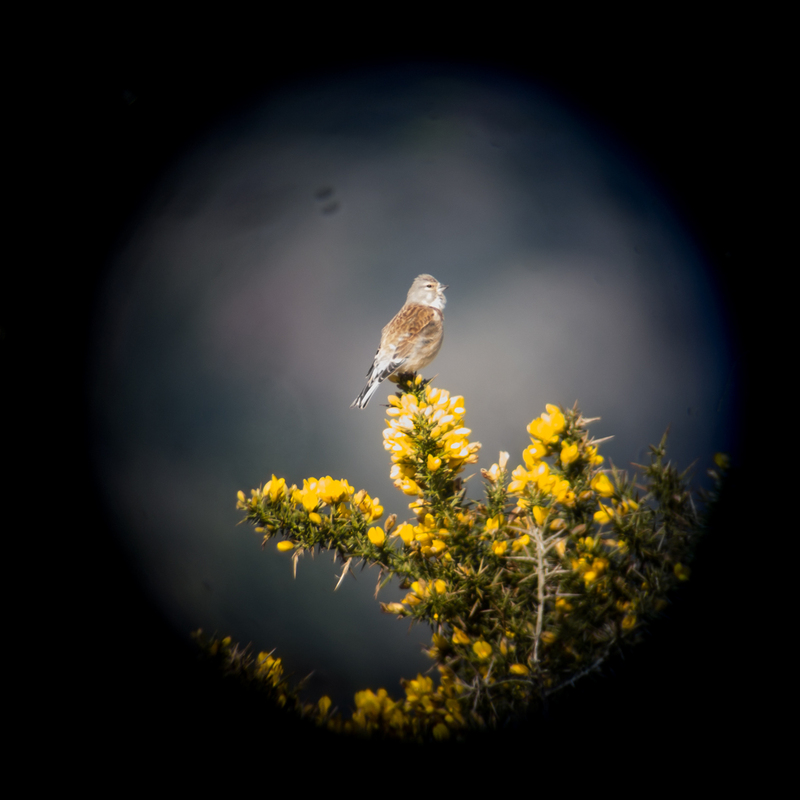 People often think of photography as a very quick process – snap and it’s done – but taking photographs through the telescope is a slow process, often made somewhat frustrating by the fact that my models, the birds, are rarely keen to pose for long periods of time. Some, I am convinced, know when I am ready to take a photograph and deliberately choose that moment to flit away to another tree. First I set up the tripod holding the telescope under a promising tree, then peer through the eyepiece and scan the edge of the branches for birds; when I find one, I lock the telescope into place and ease it into focus. 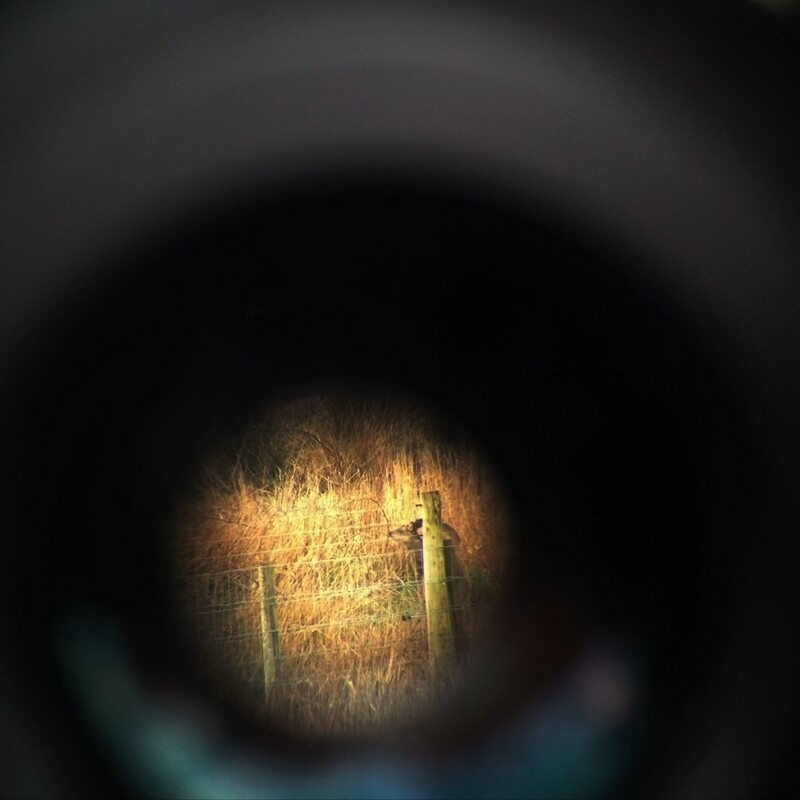 I then reach for my camera, carefully place its lens against the telescope’s eyepiece and pull it too into focus. Only then do I press the button to take a photograph. The finished photographs have an intriguing quality. 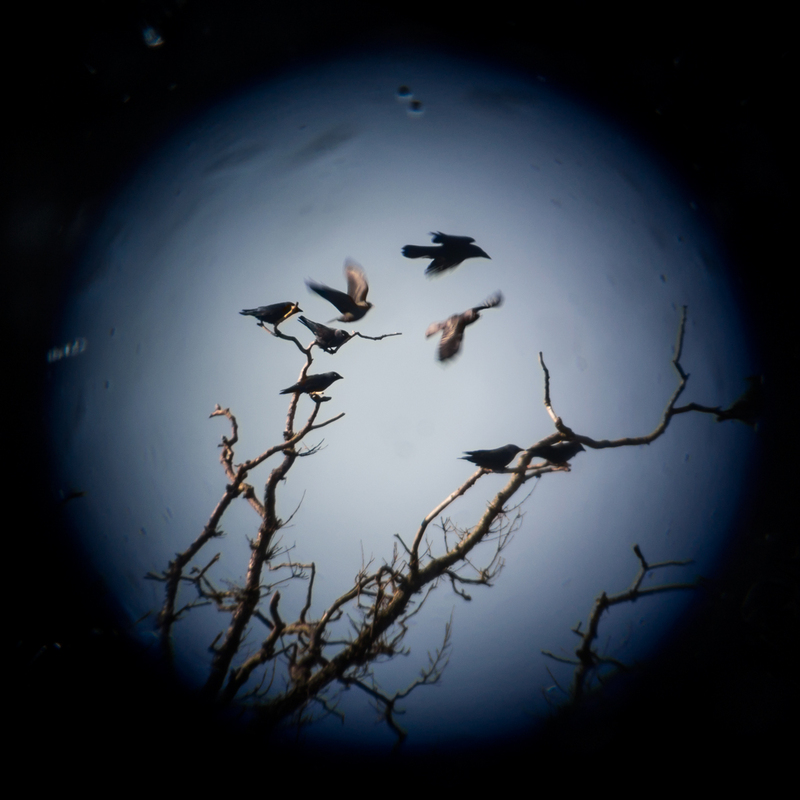 Unlike the wildlife photographs taken with a high-powered lens attached directly to the camera, the photographs pick up the traces of the telescope: from the round circle of light one sees peering through the eyepiece, the imperfections of the lens, to the dirt accumulated on successive surveys. On another level, I like to think that the image of the telescope relates something of the experience of the RSPB staff and volunteers who conduct these surveys throughout the year. Emboldened by my early success, the past week has seen me undertake my own unofficial ‘bird survey’: striding around the reserve armed with a telescope and camera trying to catalogue as many varieties of birds as I can in the time I am here. I do not yet know what form my final artwork will take: whether these photographs will hang alone or in concert with other pieces produced while on the residency. For now, I will be continuing with my survey, so if you happen to be visiting the reserve and should see me hunched down over a telescope, camera braced against its eyepiece, do stop by and say hello. This post was originally published on 20th April 2016 as part of my SGSAH-funded residency at RSPB Mersehead. Original URL: http://www.rspb.org.uk/community/placestovisit/mersehead/b/mersehead-blog/archive/2016/04/20/why-are-you-here.aspx.